We understand the value of funerals that allow mourners to remember and honor their loved ones in a special ways. We want our funeral home be a central gathering place for family and friends to give emotional and physical support to one another, provide closure for the bereaved and to help survivors to better cope with grief. The funeral process confirms the reality and finality of death and initiates the grieving process. We grief with our customers and understand that our customers are the frailest at this time in their lives and need full attention from our staff. 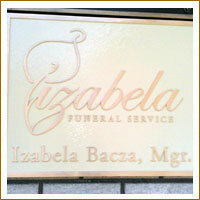 Izabela Funeral Service offers several types of funeral services. We take into consideration the needs of each individual family member and offer many options. Whichever type of service you choose, our staff will coordinate every detail for you, giving you more time to concentrate on family and friends. It may help family members to have a viewing type of funeral service, to begin the healing process. The body present serves as a focal point for mourners and helps them acknowledge the reality of death.